It has been years since I’ve ventured below Tribeca and down to the Financial District and Battery Park City. The area, decimated physically and emotionally after September 11th, is now becoming a worthy destination due to the recent openings of trendy boutiques, two exciting food halls and the completion of the World Trade Center and the National September 11th Memorial Museum. With many more businesses and hotels slated to open in the coming months, lower Manhattan is an exciting place to visit. Brookfield Place: Formerly known as the World Financial Center, and since 2014 as Brookfield Place, this complex of office buildings, restaurants and shops is directly across from the World Trade Center. Suffering extensive damage on 9/11, the Winter Garden Atrium, a 10-story glass pavilion within the WFC, became the first major structure to be restored and reopened after the attacks. Today the new Brookfield Place is back in business, part of a bustling and reemerging new Financial Center. Eat at Brookfield: Inside Brookfield place, one floor apart, are Le District and Hudson Eats. Hudson Eats is a gourmet food court with a great selection of vendors including Umami Burger, Skinny Pizza, Little Muenster, Num Pang Sandwich Shop and Tartinery. I only wish airport terminals would copy this winning formula. Le District, directly below, is a 30,000 square foot French inspired market, think Eataly with croissants. (The actual Eataly is opening in nearby 4 World Trade Center, no predicted date as of yet.) It’s divided into different market areas, such as a fromagerie, boulangerie and fleuriste, with many bar/counter areas to sit and eat. The main restaurant, Beaubourg has outdoor seating overlooking the Hudson. Breakfast: Start the day at Black Seed Bagels, part of Hudson Eats, for hand rolled, wood-oven baked Montreal style bagels. Pair it with the house beet lox that first got people talking at the original Nolita location. With a new East Village location opening soon, I am hoping for an explosion of Black Seed’s all over the city, they are some of the best bagels I’ve had in a long time. Or head to the café at Le District for coffee, croissants or pastries. Take a seat in the light filled atrium or on a nice day the tables outside. Lunch: I ordered the noddle bowl at Blue Ribbon Sushi choosing the hijiki and zucchini salads to go with the shiso soy dressed soba noodles. Paired with the handmade dumplings from Northern Tiger, it was a very happy lunch. Shop: It’s not all about food at Brookfield Place, as high end stores aim to cater to locals and tourists alike. Vince, Scoop, Paul Smith, Bonobos, Lululemon and Posman Books are some of the stores who have already set up shop, with a large 3-story Saks Fifth Avenue opening in 2016. Museum: Honoring the victims of the September 11th attacks and bearing witness for generations to come, the 9/11 Memorial Museum is built into the foundation of the former World Trade Center. 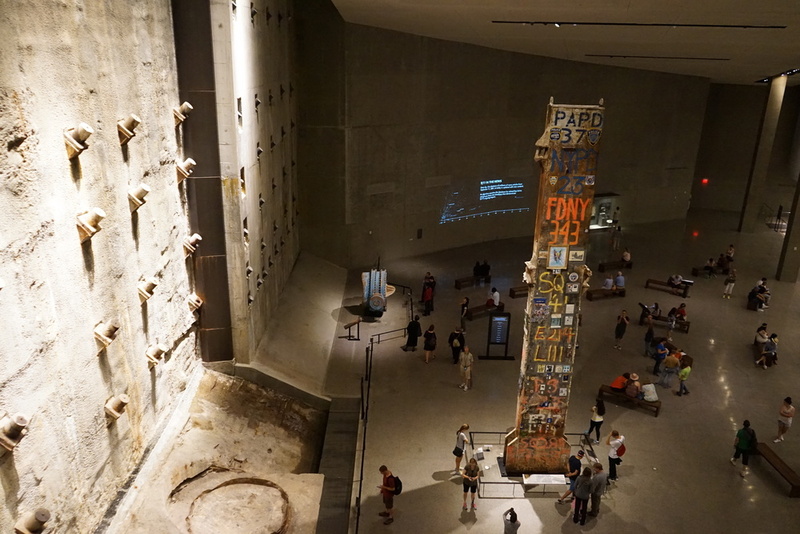 It is architecturally inspiring, a somber darker space reminding me of Washington D.C.’s Holocaust Museum. There is much to see and you should allow yourself a minimum of two hours. At first I was intrigued by the design, caught up in the subtle effects and ambiance. The experience got more and more emotional and raw as you progress further into the depths of the museum. 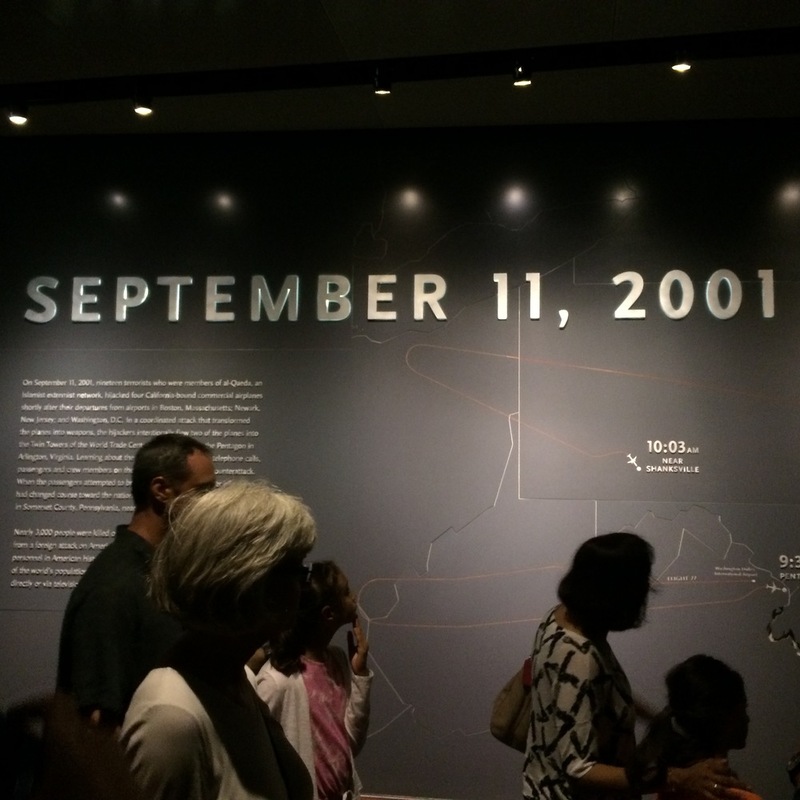 Most wrenching to me was a space displaying wall-to-wall photographs of all who died that day. Within that room, in a smaller enclosed space victim’s names are read aloud, one after another. Simultaneously their images; short biographies and remembrances told by family members are projected onto a wall. It was hard to listen and watch; yet hard to move on, too many stories, too many lives cut short. Tuesdays at 4 pm family members speak in the theater and it is first come first served. Before your visit purchase timed tickets to the museum online or expect a wait. 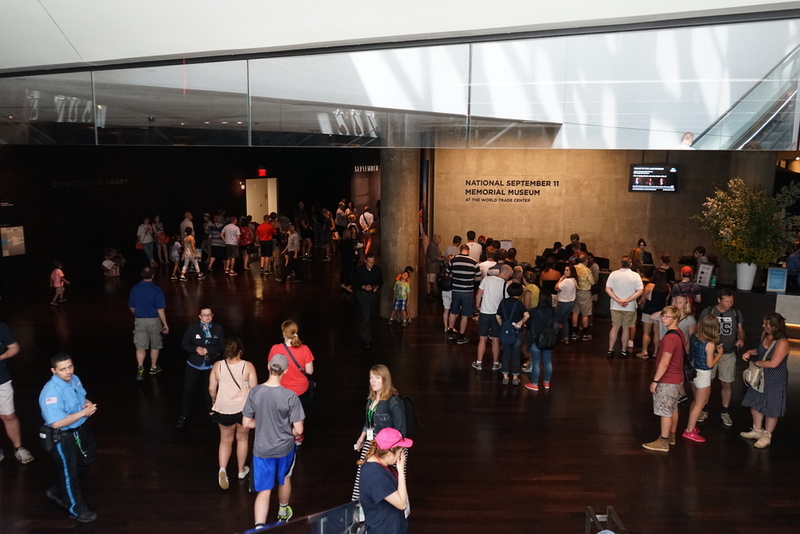 The museum was very crowded when I went, but still manageable, especially in the larger areas. Memorial: Right outside the Museum visit the Memorial Fountains, opened on the tenth anniversary of September 11th. Two twin reflecting pools with cascading waterfalls are built on the footprints of the two towers. Engraved on bronze panels edging the fountains are the names of the victims of the attacks on the Twin Towers and the Pentagon, of the hijack of Flight 93, and of the 1993 bombing of the World Trade Centre. 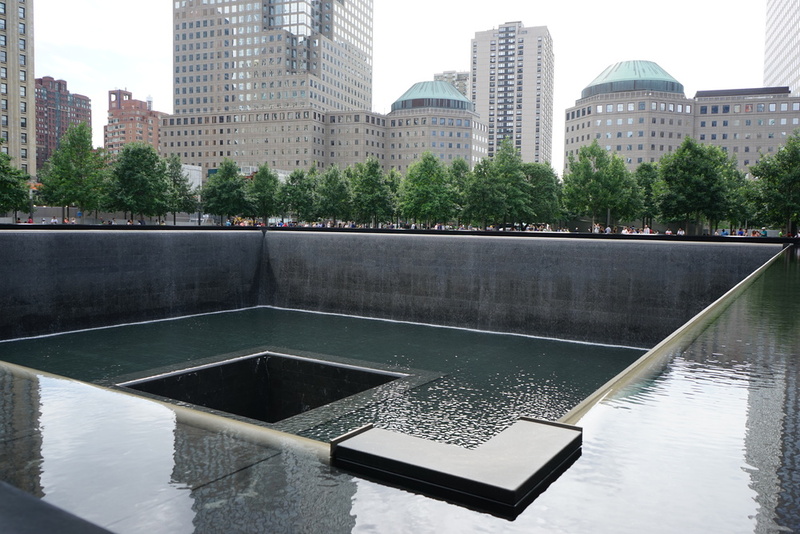 Disturbing and surreal was the amount of people posing for photographs or taking selfies in front of the fountains, ignoring the significance of hallowed ground. Walk: Start at North Cove Harbor, outside Brookfield Place, and stroll the Battery Park Esplanade with stellar views of the Hudson, Statue of Liberty and the New Jersey skyline. Pause at the Irish Hunger Memorial built of stone, soil and plants. Watch the kids playing at Nelson Rockefeller Park and the commuters rushing for their ferries. Sunset Cocktails: You’ll soak in more than the views of the Hudson and Statue of Liberty at the Loopy Doopy Bar on the rooftop of the Conrad Hotel. Order one of the alcohol infused People’s Ice Pop’s served in a glass of Prosecco at this seasonal hangout. Dinner: Back at Brookfield Place, eat at Parm from the team behind Carbone, Santina and Dirty French. The choices will get harder in the next few months with Amada, serving tapas form chef Jose Garces and L’atelier de Joel Robuchon opening soon. Next Time: I didn’t make it to the new One World Trade Center, also known as the Freedom Tower and the main building of the new Trade Center complex. I fear it might be disconcerting, to me, to be that high up with my memories of special occasion dinners and wine classes at Windows on the World and all that came after, but I’m sure the ascent in 60 seconds to the top of the tallest building of the Western hemisphere will entice millions of tourists and locals alike. With three levels of panoramic views like no other and interactive exhibits it may be something that eventually entices me as well. Take a ride in the elevator without leaving home here.